Game, set and spats: double-standards in singles? The for-or-against-Serena debate that has raged over the past 48 hours is a good example of how conflict plays out in the public eye. Every pundit has to state which side of the fence they're on - and rational analysis gets crowded out by positional judgment. But if we look slightly more dispassionately at what happened, we can see a complex situation. 1. The starting point is that the game of professional championship-level tennis itself is an adversarial process, and one of the reasons we like the drama is the high level of tension - and emotion - it creates. So how come we suddenly get upset when that emotion boils over, as it's bound to do sometimes. Serena may be a superstar but she's still a real person and we can't pick and choose the emotions we let her display. 2. But then there's the match itself. Firstly, the umpire issues a "code violation" warning because he spots Serena's coach trying to send her tactical advice from the sidelines; we know this for sure because after the match the coach admits that he was indeed trying to do this, although Serena says she didn't see it. Next, after losing her serve, Serena smashes her racquet and gets another code violation, at which point she explodes: "I didn't get coaching. You need to make an announcement that I don't cheat. You owe me an apology". Then, Serena has her serve broken again, which prompts the "You stole a point from me. You are a thief" complaint which cost her a third violation for verbal abuse and therefore she forfeited a game. 3. By this time the match was pretty much over. 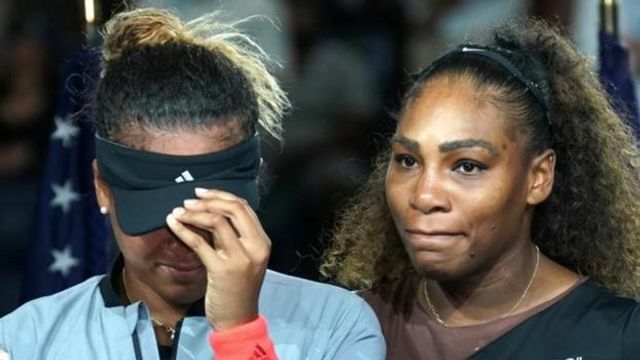 Serena tried to fight back bravely but it was too much and so Naomi Osaka, a 20-year old Japanese player who has idolised Serena since childhood, won her first grand slam tournament. And still the crowd bayed and booed so much that the prize-giving ceremony saw even the winner, at the pinnacle of her career to date, in tears. 4. At which point, Serena intervenes: "Let's not boo any more," she pleaded. "Congratulations Naomi. No more booing." Some say that was her maternal instinct kicking in - but maybe she's just a decent person whose motivations don't need to be pigeonholed. Just as her and others' subsequent complaint that the umpire's behavior was motivated by sexism is a personal labeling that comes across as a criticism of an individual rather than a broader observation that there is inconsistency across the game, with many examples of equally poor conduct (often by men) being left un-penalised. (Not that I'm claiming there isn't sexism in the modern game - the recent storm about players changing their shirts on court is one of the most glaring examples of double-standards). So my problem with all of this is that it feels like there's a mandatory rush to judgment. Not that I have a problem with people saying that they don't like certain behaviours, but that doesn't make Serena a motherhood figure, or an umpire a sexist or a thief. One of the fundamental lessons from Getting to Yes, Fisher and Ury's negotiation classic that is still worth a read, is the notion of "separate the person from the problem". Unfortunately all too often when a problem arises, we do the opposite - we make the problem the person by giving them labels and applying judgments. And as spectators we take sides. That's not good negotiation. CEDR's training team offers a wide range of tailored packages that include our new modular programme in 'Skills for Life' - master active listening, managing emotion, how to have that difficult conversation and be an agent of influence. To learn more, contact the CEDR Skills team at training@cedr.com. "This must be the most surreal experience. A worthy champion but sadly for her it will be remembered for a very, very different story." Naomi Osaka defeated her childhood idol Serena Williams to win the #USOpen. Former Wimbledon champion Pat Cash said it was "the most bizarre match" he'd ever seen.